Introduce NutriStudents K-12 to the school foodservice marketplace, leveraging the company’s extensive intellectual property to establish it as a first-to-market, plug-and-play foodservice platform equipping districts with delicious USDA-compliant menus, training resources, and streamlined ordering and reporting procedures. Act as outsourced marketing department, providing ongoing counsel on corporate matters and take-to-market strategy, as well as execution of print and digital marketing communications, proposals for important national cooperative purchasing contracts, and ongoing sales and customer service communications. In part due to Renown Marketing’s ongoing counsel, messaging and marketing communications support, NutriStudents K-12 is growing each year, adding enthusiastic distributor partners, franchisees and school districts across the country. It successfully secured a 3-year contract with the National Joint Powers Alliance, which introduced NutriStudents K-12 to its more than 50,000 members nationwide. Ongoing content development and email campaigns continue to attract sales leads and convert prospects to clients. Successfully launch Eastman’s new acetylated wood brand, Perennial Wood™, into the building products marketplace, establishing awareness, credibility and trial with consumers, builders and remodelers, lumber materials dealers, and architects and designers. Partner with the Perennial Wood Marketing Communications team to create extensive brand-supporting collateral materials to support the brand launch at the International Builders’ Show, where an aggressive public relations campaign gains exposure to target audiences through the media. Build on the launch momentum with intriguing case studies, ongoing public relations outreach and continuing education coursework for architects. The media launch party was a resounding success thanks to the Renown Marketing team and its ability to interest many key trade and consumer shelter media to attend. Many editors who were unable to attend the event, visited with spokespeople in the booth during the run of the trade show. All told, the initial PR campaign netted over 2.08 billion positive impressions of the brand in the four months following launch, for an equivalent advertising value of nearly $238,000. The media coverage helped educate audiences about the brand’s value proposition relative to competitive products. 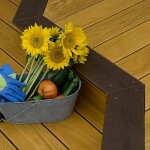 In addition to being the public relations agency of record for Perennial Wood, Renown Marketing continued to help the Perennial Wood team wherever help was needed, including with writing and research work, showcase project scouting, coordination and oversight of photo shoots at project locations, and architectural marketing. Maintain national visibility of Weather Shield Windows & Doors through editorial coverage of new products, expert spokespeople and profile projects in consumer shelter publications, architectural and building trade publications, home improvement television producers and networks, and general consumer media. Build relationships with editors by delivering relevant story content and expert sources. Cultivate story ideas about new products, manufacturing and corporate advancements, environmental initiatives and unique projects, and offer to media through continual outreach. Weather Shield has reaped ongoing rewards of strong editor relationships. Because Renown Marketing Communications is committed to responding to editors’ needs within 24 hours, editors often called Renown first when working on a story about windows or doors. The media results are a testimony to these efforts, generating millions of impressions over the course of a single year. The coverage extended the company’s visibility and credibility through perceived third-party endorsement not possible through advertising. Because of the ROI Renown Marketing delivered, publicity was a mainstay Weather Shield’s annual marketing communications plans. Heighten the visibility, notoriety and respect of Saint Thomas Academy as an elite college preparatory school. 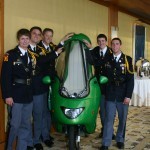 Publicize the Academy’s Experimental Vehicle Team’s ingenuity in developing a street-legal electric motorcycle with unique safety features for urban commuters. Leverage the country’s high gas prices and the project’s association with MIT to generate media interest. Renown Marketing Communications’ efforts generated over 3.5 million impressions in broadcast and print coverage from coast to coast, sparked by a CNN segment airing on American Morning, Headline News and on the Web. CNN affiliates across the country and in Canada rebroadcast the segment for additional visibility. Persistent pitching and follow-up led to noteworthy placements in the Minneapolis/St. Paul market. Team members were featured guests on two TV news magazine shows and a live radio broadcast at the Minnesota State Fair. Minnesota Public Radio produced a four-minute segment on the safer electric motorcycle, posting additional content on its Web site. All of the community newspapers in the vicinity of the school ran a feature story on the boys and their bike. The Experimental Vehicle Team was named to the METRO 100, a listing of 100 things, people and places loved by METRO’s editorial staff. In addition to traditional media coverage, the team garnered coverage on many online motorcycle, engineering and automotive e-zines and blogs. Inspire people to tell others about CaringBridge and its free websites for persons facing long-term health care conditions. Thank donors and sponsors for their ongoing support of the nonprofit service. Share the positive experiences CaringBridge site authors and subjects have had with the service in an engaging and professional annual report. Incorporate a theme highlighting the importance of community and a direct call to action to spread the word of CaringBridge’s free service. CaringBridge is a valuable connection between individuals in the midst of unforeseen events and their loved ones, coworkers and acquaintances. It becomes a lifeline. 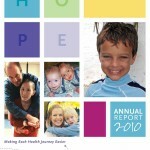 The 2006, 2007, 2008 and 2009 annual reports written by Renown Marketing highlighted the value of community through heart-warming stories of families and their support communities that were held together by CaringBridge sites. The photos subtly drew the reader into the subjects’ communities while the graphic design skillfully wove the theme throughout the piece. According to feedback from CaringBridge, Renown Marketing successfully articulated the delicate balance of urgency, compassion and support in the reports. Objective: Help dynamic school caterer increase its market share in a highly competitive and strictly regulated industry. Approach: As the marketing communications agency of record, Renown Marketing Communications works closely with the company’s chief executive officer to articulate her voice and vision in sales proposals, ongoing marketing communications and regular client communications. By being immersed in the client’s business and industry, Renown Marketing Communications creates persuasive, easy-to-understand, on-brand communications that make complex issues understandable while succinctly addressing school food service directors’ pain points and foster loyalty among existing clients. Results: Renown Marketing Communication’s work has helped CKC Good Food create a consistent brand voice, gain new clients, maintain existing clients and become known as the company to emulate by competitors. Each year, CKC Good Food welcomes new clients and attracts accolades from current clients, partners and even, regulatory officials.